Starz has a neat orderly system for each of their shows. 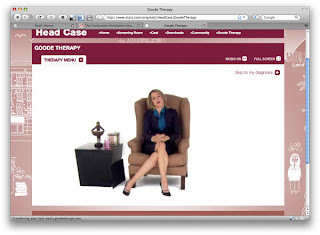 Sections on the cast, videos and a predictable bookend "special" section. 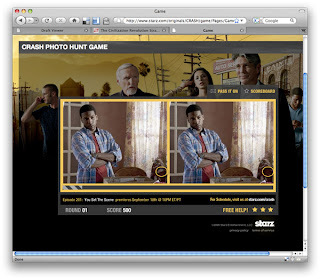 For the show Crash, the special section is a photo-hunt game. I haven't seen Crash or Head Case, but Party Down is a great show. And this interactive piece does it no justice whatsover. It's flat and phoned in. This is what happens when you get too formulaic with your sections. When putting together the content for your site, the thought is "Ok, now we need to put something in the special section" instead of "how can we extend the entertainment and soul of the show interactively?". that sounds awfully idealistic i know. 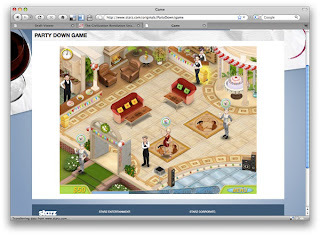 but a photo-hunt game?